I see this configuration working for a single port sheet for a Gennaker. A Parasailor requires 2 lines per side. (a sheet and guy). I'm just wondering how you switch between the 2 lines per winch without a set of line clutches. Or if the guy line can just be tied off on a cleat. I'm debating whether to add the Gennaker option to our Lucia, or just add a port winch ourselves and other necessary blocks to run a Parasailor. You could e-mail Parasailor and ask them, as they have great training and support. I believe a port and stb. cleat is all that's needed for the guy lines. This video may help you also. Port side Helia Cheeky Monkey. Port side Helia 44 - Cheeky Monkey. This maybe an FP installed port winch, but everything else is a custom modification. Cheeky Monkey has made it across the Atlantic and Pacific oceans using their Parasailor with this setup, so it must work well for them. Cheeky Monkey also has another winch on the stb. stern for the Parasailor setup. Not sure exactly what they have there in front of the winch, but this looks like a good solution. When it comes to downwind passages in open seas in less than ideal weather, the last thing on most cruising sailors minds is flying the Spinnaker or Parasailor, especially at night. There is, however, a simple and easily handled alternative of particular relevance to shorthanded crews, it’s called “Twin Jibs”. What is required is a twin grooved jib furler on which to hoist two identical traditional working jibs on a single halyard. These sails have their own set of sheets which lead through the fairleads and on to the cockpit winches in the usual way. By utilizing twin identical working jibs set from a twin-grooved jib furler. Most Cruisers and Delivery Captains that have tried it really like its simplicity and functionality. It requires a bit more wind, around 15 kts true min. It’s very easy to handle. No Mainsail is used. The Autopilot tracks nicely. “Twin Jibs” overcomes the need for additional crew on longer hauls, and it’s a fraction of the cost of Spinnakers or Parasailor and their related hardware. It’s really just plain sailing. All FP Jib Furlers have Twin Tracks on them. Definitely needs 10mm Halyard not the factory 12mm. Too much friction. I went with 10mm spectra. Stronger, less stretch and better quality. It does mean a trip up the mast to swap, but I wanted to remove any twist and end for end it anyway so swapping was no big deal, however 53 meters 10mm spectra isnt cheap. Unfortunately the way the zspar halyard is rigged means it doesn't work as well as it could. The outside stand of the halyard goes to the top of the mast where its attached. This is the stand that the soft shackle rides along. The sail is heavy so the hook starts sliding up the mast as you start pulling on the halyard and the sail hasn't yet hooked up (Sorry hard to explain) but 2 times now I have had the hook half way up the mast and the sail still 1 meter below and unlikely to catch up until it gets to the top. Easy fix, I have attached a piece of shock cord from the eye of the hook to the next car. This seems to give it enough tension so it doesn't start sliding up too soon so that the first lift is the sail not the hook. The other issue is the soft shackle needs to be very stiff and ideally have a nice slippery outer sheath so it doesn't get caught sliding over the hook. I'm still very please and now its set up properly it works great, even if you don't rig the shock cord it's still very easy to pick the sail up and drop it on the hook before raising as you can use 2 hands and it will just drop into place due to the halyard. I would certainly recommend it over the normal setup. Its a little pricy but it is a boat part and (unlike my brother) it does work. I understand that the factory now fit intermediate cars on the main on the Lucia. Could I impose on one of the Lucia owners to post a close up photo of how they are attached. I'm told they use shock cord to attach the car to the sail but would like to see how its done. 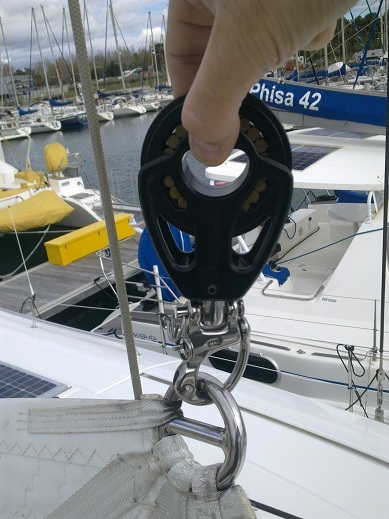 Not sure if this issue has popped up but when operating the Karver lock it's important to ensure the dyneema loop from the mainsail head is seated firmly in the bottom of the Karver lock. We had an incident where the loop hung up at the top of the Karver hook and heated the main halyard enough to part the internal strands causing the mainsail to be stuck 2/3 of the way up. Required the crew to bosun chair up, drop the mainsail manually, reverse and reroute the halyard to attach the 'good end' again through the Karver hook. This was on a 11mm halyard that was 6 months old. Anyone think that could be replaced with a hard shackle on the Karver Gaff lock? I was also wondering about a hard shackle. It would have less friction than the loop. although I think the Karver is Aluminium and that may not like a S/S piece engaging with it. Weve had the same issue - the T connector for the Dynema loop - needs to be at the mainsail end - not the Karver hook end - otherwise it jams - and the main halyard will not pop over the hook - and nor will the Karver hook drop to the deck - and weve observed that the karver hook - with the Dynema loop in the wrong position - will cause the Karver hook to rise to the top of the mast - without the mainsail engaging - and the interference on the main halyard means that the hook will not return to the boom - without a person (me, three times now) to free it.. twisting the Dynema loop so the T connector is at the mainsail end of the look - and there is a clean rope to engage the hook - works... But I do like the idea of the shockcord on the next mainsail track car as well ! Attached is the correct Karver Hook Dynema loop positioning.